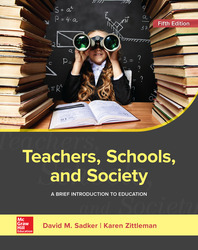 Teachers Schools and Society: A Brief Introduction to Education offers a broad, diverse, and stimulating view of education. Written in an engaging, student-friendly style, readers are immersed in an inspiring world of the teacher where current education headlines are brought to life. This new edition provides a broad yet precise exposure to the realities of teaching and the role of education in our society. The text helps to answer important questions such as: Do I want to become a teacher? How do I become the best teacher possible? What should a professional in the field of education know? How are schools and teaching changing?